The C-More EA9 HMI (Human Machine Interface) Series Panel will communicate to the PLC directly through the tag database that we discovered in our first program. We were able to read and write individual bits in the PLC. Panel to PLC communications is used to write information into the PLC; like current screen number displayed, good communications, pop-up keyboard, and current language number used in the HMI. PLC to Panel communications is used by the PLC to control the HMI. Switch to screen number, beep, increment and decrement the Clock by one hour, clear alarm history, clear alarm count, start screen saver and select language are the items you can control in the HMI. PLC Error is used to communicate internally in the HMI the PLC error state and PLC error code value. We will be setting up and testing our PLC to Panel and Panel to PLC communications on our EA9 C-More. Let’s get started. Continue Reading! We will now put our first program into the C-More EA9 HMI Panel using the C-More programming software. The Do-More Designer Simulator will be used with a modified Start Stop Jog Circuit so we can use our HMI screen to monitor the output as well as control the inputs on the PLC. Communications will be established to our C-More EA9-T10CL unit and the firmware will be updated. We will then develop our control for our PLC ladder logic circuit. The PLC logic for our circuit can be found on our post: How to Make a Start / Stop / Jog Circuit in a PLC. The YouTube video can be seen here. Our C-More EA9 HMI Panel will be communicating to the PLC simulator via Ethernet with the Modbus TCP protocol. Let’s get started. Continue Reading! The C-more touch panels include a series of built-in System Setup Screens that allow you to view detailed information about the panel; adjust certain features; configure communications; test various functions of the touch panel; backup & restore firmware, a recipe, log, and project memory; clear memory and reset all values and conditions back to the original factory defaults. 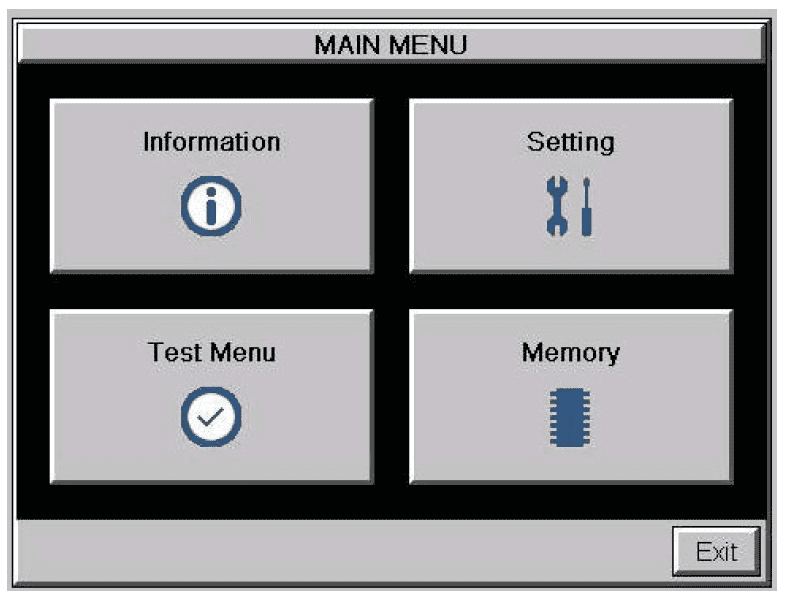 Information, Setting, Test Menu and Memory make up the four Main Menu setup screens. Information – The information tabs display details about the touch panel model; the panel’s name; version information for the hardware, boot loader, and firmware; clock source, and beeper status. Other tabs display details on the panel’s internal memory and the status of any external memory devices. 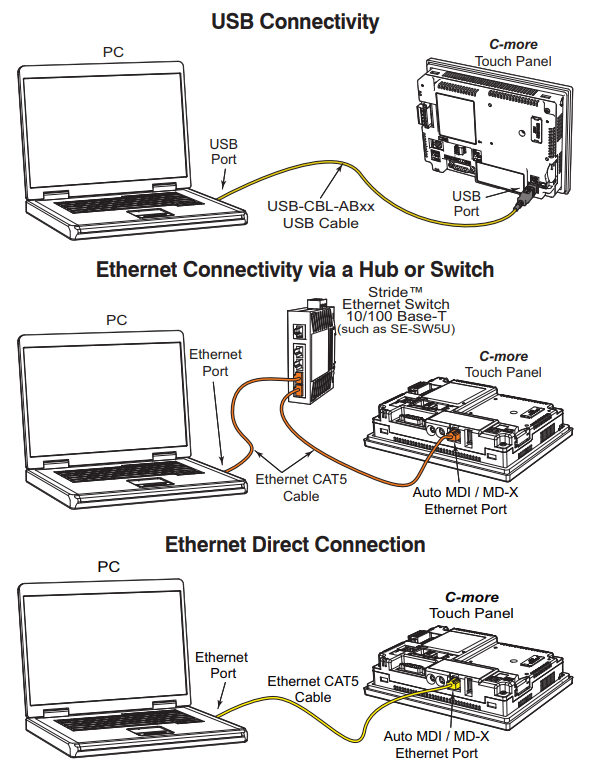 Communication port details are available in this area, as well as an error log to help in troubleshooting the system. Setting – This is the area for making adjustments to the internal clock, adjusting the brightness of the display, setting the IP address adjusting (calibrating) the touch panel, enabling or disabling the internal beep, and enabling or disabling a mouse pointer. Test Menu – This menu will allow you to test the touch panel, test the display, test the user LED, test the communication ports, and test both the internal beeper or the audio line output. If a speaker with an amplifier is connected, a WAV sound file is a system provided for the audio line output test. Memory – The Memory menu allows you to either backup or restores your project, log data, recipe data and/or system memory. Selections can be made to backup to optional SD card memory or USB pen drive memory. The menu selections also give you the ability to clear the memory, and there is also a selection to reset all of the touch panel settings back to the original factory defaults. We will be reviewing these system screens of the C-More HMI Panel. Let’s get started. Continue Reading! 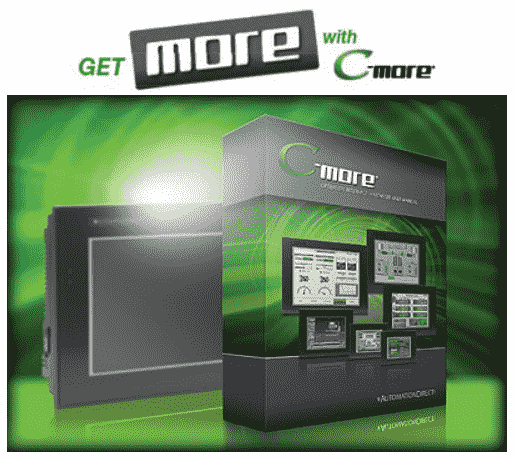 The C-more Programming Software is a free download from Automation Direct. The software can run in DEMO (demonstration) mode or a key can be purchased to unlock this software. This powerful C-more Touch Panel programming software makes HMI touch screen panel setup and programming quick and simple. 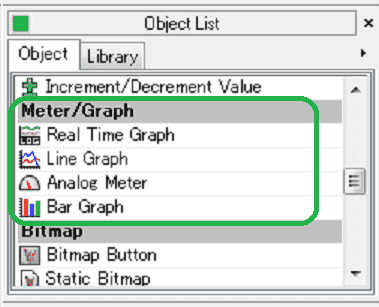 Simply drag and drop the objects from the object bar onto the screen construction area. A complete set of control panel objects include pushbuttons, selector switches, pilot lights, text and numeric data displays, bar graph displays, static and dynamic bitmapped images and more. Configure your PLC tags and click on the objects you want to use. A built-in simulator will allow you to review your work on the computer before downloading the project. – You CAN download our sample projects and explore the capabilities of C-more. 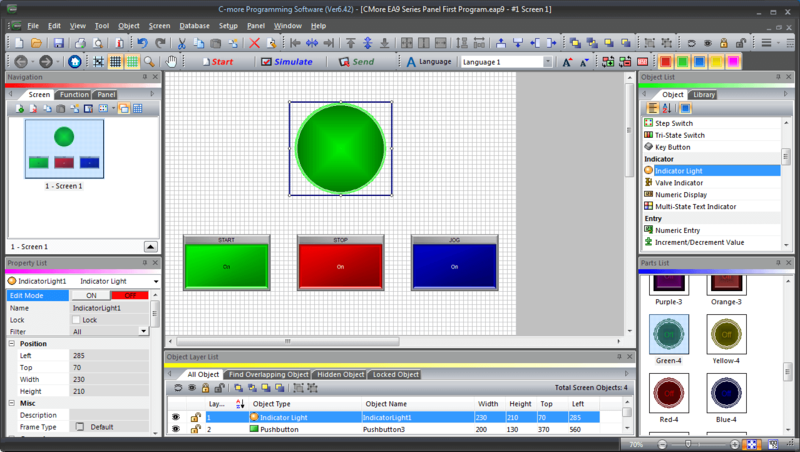 – You CAN use the Simulator to test your project on the PC and see how the Simulator can save you hours of programming time. – You CAN create your own objects, and save them in your object library. – You CAN explore the online help, and find answers to many questions that might not be covered here on the website. The full package will allow you to save your projects, download them to a panel and includes the full symbol factory library with over 4000 symbols. Let’s get started. Continue Reading! Human-machine interfaces (HMI) are made to display and control operations for our automation solution. Information is displayed in a graphics format. 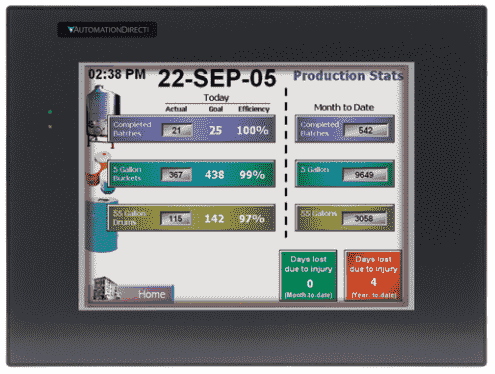 (Graphical User Interface – GUI) The HMI is usually part of the SCADA (Supervisory Control and Data Acquisition) system. Communication from the HMI to the control is usually done through a serial (RS232 / RS485 / RS422) or Ethernet (RJ45) method with different protocols depending on the manufacturer of the control. The automation control device is not limited to a PLC. (Programmable Logic Controller) You can communicate also to drives, temperature process controllers, etc. The HMI usually will include several different protocols and port configurations to maximize the amount of control product that it will be able to communicate. C-More Operator Panels come in 6”, 7” wide, 10”, 10” wide, 12” or 15” models. They are programmed using the EA9-PGMSW programming software through either the USB or Ethernet cable. A voltage supply of 12-24 VDC is required for the panel. The optional C-More AC Power Adapter EA-AC can also be used to supply this voltage. We will be looking at one of the newest members of the C-More Panel HMI devices from Automation Direct. This is the EA9-T10CL. This ten-inch colour TFT LCD screen offers great features that we will be exploring as we review this product. Let’s get started. Continue Reading! The C-More Micro HMI Panel software uses virtual components called Objects. Meters and Graphs are part of these objects. They can represent a range of numbers and are programmable to simulate the functions that you require on your automation project. This helps you produce simple, intuitive looking human machine interfaces. We will now look at the meters and graphs that we can use with our HMI micro panel. They can replace the older chart recorder equipment that is still in use in some manufacturing facilities. These objects will represent the data in the PLC for the user to interpret. Let’s get started. Continue Reading!